Isabelle Rolaine, a Breton sorceress, is found dead in Hob's Fall Cave, near the entrance. 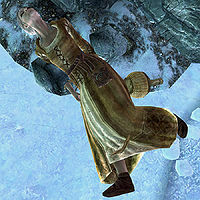 In life, she was the lover of Ranmir, a Nord living in Winterhold. Some time ago, she disappeared, sending Ranmir into a drunken stupor with sorrow. In the undelivered letter to Ranmir found on her corpse, it's explained that Isabelle left to try solve their financial troubles, which they were suffering beforehand. Isabelle went to Vex, of the Thieves Guild, an old friend. Vex tipped her off to a potentially lucrative target for theft in Hob's Fall Cave, which would alleviate her and Ranmir's money troubles permanently. Based on the numerous empty wine bottle near her corpse, it seems Isabelle may have imbibed some liquid courage before attempting the theft, only to either pass out or be taken by surprise in her intoxicated state and killed. She can be found wearing a belted tunic along with a pair of boots. She is described as a young woman by NPCs in the game, but when her body is found she looks like an old woman. This issue has been addressed by version 1.3.3 of the Unofficial Skyrim Patch; she will look like a young woman as described. This page was last modified on 8 December 2018, at 16:05.